North Bergen residents will be hit with even more congestion as construction on the Route 495 viaduct progresses. Commuters and residents will endure more traffic on local roadways already plagued by daily rush-hour jams. New Jersey Department of Transportation (NJDOT) officials announced that the eastbound Columbia Ave. exit ramp on Route 495 will be closed for several weeks, as structural work is completed in that area. 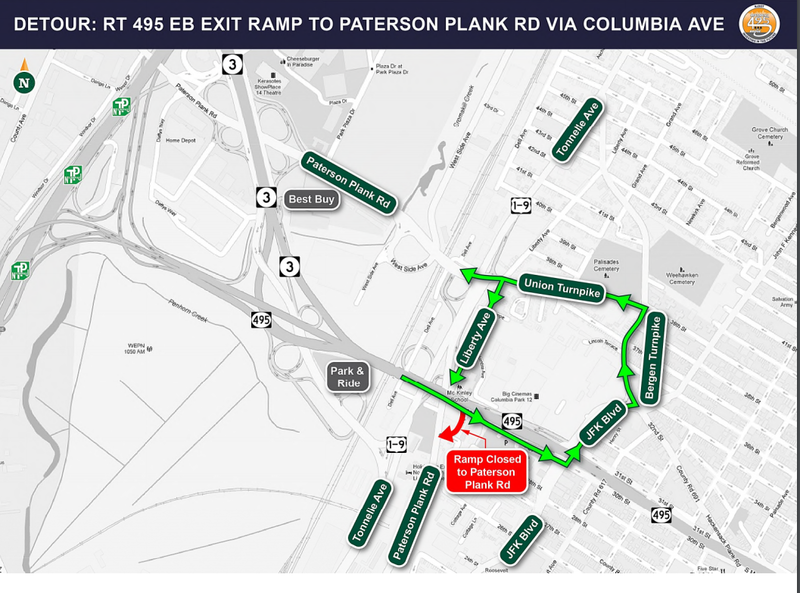 The exit ramp provides access from Route 495 to Paterson Plank Rd. The detour is like a jug handle almost one and a half miles long on some of the township’s busiest residential streets. Since motorists won’t be able to get from 495 to Paterson Plank Rd. from the usual exit, they’re being redirected to take the 30th St. ramp to Kennedy Blvd, which is the next exit. From there, they turn left on Bergen Turnpike, left on Union Turnpike, left on Liberty Ave., and then straight to continue to Paterson Plank Rd. The detour will last for “several weeks,” NJDOT officials said. IEW Corp, the project’s contractor, installed a concrete barrier to close the exit ramp; that installation led to periodic standstills for eastbound traffic. According to NJDOT, the Columbia Ave. exit ramp will be closed and barricaded during work on the exit ramp. Mairin Bellack, NJDOT’s deputy director of communications, said that NJDOT will be cooperating with local police to mitigate traffic while the detour is in place. Bellack said there will also be digital monitors in place to mark the detour route for motorists. IEW also closed an eastbound lane on 495 to pour a new concrete deck. Traffic in that direction will be reduced to two lanes. According to NJDOT, maintenance will extend the bridge’s life for about 75 years, and eliminate the need for emergency repairs. A total of $90.3 million is being spent to reconstruct the bridge deck, repair structural steel, conduct substructure repairs, improve drainage, and repaint the bridge. The Route 495 bridge was built in 1938, and is rated as structurally deficient and functionally obsolete, according to NJDOT. To find out more about NJDOT’s Route 495 restoration, visit www.restorenj495.com. The hotline for the project is 201-408-8495; NJDOT posts updates on Twitter @NJDOT_info. For updates on this and other stories check hudsonreporter.com and follow us on Twitter @hudson_reporter. Mike Montemarano can be reached at mikem@hudsonreporter.com.